1500s Water lettuce, Pistia stratiotes, introduced, perhaps in the ballast water of ships from Spain or South America. 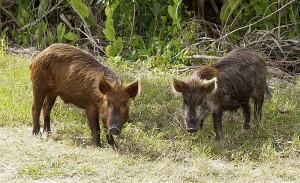 1539 Feral pigs, Sus scrofa, begin with the introduction of Spanish domestic stock in Florida by Hernando de Soto; whether the release was accidental or intentional is unknown. — Purple loosestrife, Lythrum salicaria, native to Europe and Asia, introduced in ballast and likely in livestock bedding, fodder, and perhaps even in sheep fur as soon as colonists began to arrive. — Yellow toadflax, Linaria vulgaris, native to Eurasia, introduced during colonial times as an ornamental, as a dye, and a medicine. By 1759, John Bartram found it invasive. 1606 Rock pigeon, Columbia livia, native to Eurasia, is introduced to Port Royal, Nova Scotia, by French settlers as a domesticated food source. It is likely that many other introductions occurred over the centuries. 1620? Dandelion brought by the Pilgrims on the Mayflower, to be planted as a medicinal crop and used in wine-making. Or perhaps it arrived with the Jamestown settlers. Or even earlier, with the Spanish. Some even consider it native to North America. The provision list is here. For more on dandelions, click here. 1620? Fennel, Foeniculum vulgar, also known as anise, sweet fennel, aniseed, and sweet anise likely arrived on the East coast with the first European settlers. Native to the Mediterranean, it was introduced in California at least by 1880, where it has escaped from cultivation repeatedly. 1620? Lamb’s quarters, Chenopodium album, also known as goosefoot and fat-hen, introduced by northern European settlers as a spring green. 1672 Burdock appears as “The great Clot Bur” in John Josselyn’s list of “Plants as have sprung up since the English Planted and kept Cattle in New-England,” published in London in New Englands Rarities Discovered. Early 1700s Common mullein, Verbascum thapsus, native to Eurasia, introduced for its medicinal, dyeing, and fish-killing properties. By 1759, it appeared on John Bartram’s list of worst plants introduced by English colonists. By 1818, it had spread so much that Amos Eaton, author of the first Flora for the Northern states, thought it was native. 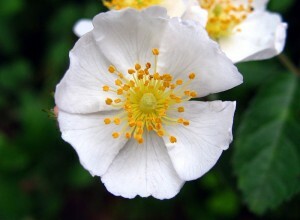 — Dog rose, Rosa canina, native to Europe, Africa, and Asia, introduced by early settlers, who used it as root stock. It can now be found growing wild along roadsides, coastlines, and wet, sandy areas. — Common yellow oxalis, Oxalis stricta, and creeping woodsorrel, Oxalis corniculata, native to Europe, introduced by early settlers, who knew of their antiscorbutic properties. — Gray garden slug, Deroceras reticulatum, native to Europe, accidentally introduced in dirt arriving with early settlers. Slugs’ presence confirmed by 1843 near Boston, New York, and Philadelphia harbors, the beginning of a nationwide career as one of our most successful synanthropes. 1727 English ivy, Hedera helix, native to Europe, western Asia, and northern Africa, introduced by European colonists as an ornamental. 1736 Asian or Oriental bittersweet, Celastrus orbiculatus, a vine native to temperate eastern Asia, introduced as an ornamental. Naturalized plants collected in Connecticut in 1916. Now naturalized in 21 of 33 states where it’s cultivated. 1745 Silktree or mimosa, Albizia julibrissin, native to Asia, arrived with early colonists, as a medicinal and a forage plant. Or in 1785 (if you’re from the South) it arrived when the French botanist André Michaux planted it in his botanic garden in Charleston. Mid-1700s Woolly mullein, Verbascum thapsus, native to Europe and Asia, introduced to Virginia as a piscicide (the leaves contain rotenone, which can kill fish) and an insecticide. 1756 Norway maple, Acer platanoides , introduced in Philadelphia by John Bartram. 1759 Broad-leaved dock, Rumex obtusifolius, native to Eurasia, listed by America’s first botanist and nurseryman John Bartram as one of the introduced plants “most troublesome” in Pennsylvania. — Scotch thistle, Onopordum acanthium, Bartram claims, was introduced by a Scots minister who arrived with a bed stuffed with thistledown, which was soon replaced with feathers, releasing a few thistle seeds into the wild. — St. Johnswort, Hypericum perforatum, native to Eurasia, listed by Bartram as an ornamental gone invasive and proving poisonous to livestock. — Oxeye daisy, Leucanthemum vulgare, native to Europe, introduced as an ornamental, made Bartram’s list of invaders, too. 1760s Scotch broom, Cytisus scoparius, native to western and central Europe, imported as an ornamental by John Bartram. 1769 Domestic pigs released in California. Late 1700s Chinaberry tree, Melia azedarach, native to Asia, introduced by French botanist André Michaux. 1784 Tree-of-heaven, Ailanthus altissima, an Asian sumac, introduced by William Hamilton in Philadelphia. 1800? Common buckthorn, Rhamnus cathartica, native to Eurasia, introduced near Nova Scotia for planting along fences and for wildlife shelter; widespread by 1900s. Early 1800s Tamarisk, Tamarix spp., introduced into the US, mostly from Asia, some as ornamentals, some to be planted as wind-breaks or to stabilize stream banks. By the 1990s the smaller deciduous species had invaded most Southwest desert riparian habitats. — Japanese honeysuckle, Lonicera japonica, a vine native to eastern Asia, introduced to Long Island as an ornamental and ground cover, spreads through the nursery trade. Wildlife managers later use it for erosion control and as winter forage for deer. 1814 Sowthistle, Sonchus spp., native to Eurasia, probably introduced accidentally as an imported seed contaminant, is first reported in Pennsylvania. It is currently found in all states. 1817 European green crab, Carcinus maenus, first reported near Cape Cod. 1840 European common periwinkle, Littorina littorea, first described in North America, is thought to have arrived on ballast rocks on ships from Great Britain plying the timber trade, Britain needing imported wood to build ships, having used up all its native trees. Mid 1800s Tree-of-heaven brought into California during the Gold Rush, mainly by the Chinese; it remains in many ghost towns, long after the miners have gone. 1850 Gold Rush rats: Alien rodents storm San Francisco and Sacramento. T.A. Barry and B.A. Patten write in Men and Memories of San Francisco in the Spring of ’50 (Bancroft, 1873): “The rats of San Francisco and Sacramento in 1850, and up to the middle of the year 1853, were something wonderful. . . . The little, four-footed, rodent devils worked damage only second to the fires of that time. . . . Zinc and tins were nailed about the floors and lower boarding, like sheathing on a ship, and signs assuring ‘rat-proof storage’ were plentiful and necessary. At dusk, the rats ventured boldly out upon the streets, racing and scampering incessantly. . . . Pedestrians and new comers felt, as they walked among the countless swarm, a constant apprehension of treading upon the wicked little vermin; nor was the new comer alone so annoyed. We never could cure ourselves at times, of suddenly halting and lifting our hands quickly upward, when some big fellow sprang within an inch of us, or struck us full and heavy, as was not uncommon. . . . A terrier dog, or a good cat, commanded a big price in those times. The captain, cabin-boy, cook, or sailor who chanced to bring with him one of those much-coveted creatures, found solid consolation in separating from his faithful companion of the voyage. 1850s Brown garden snail, Helix asperse, arrives in California when French snail farmers bring escargot to the Gold Rush––a creature that would become a notorious agricultural and horticultural pest, especially in citrus groves. ~1850s Bullfrogs introduced to California to feed gold miners, after they had eaten the native red-legged frogs to near extinction. 1860 Burning bush, Euonymus alatus, native to northeast Asia, officially named. First dwarf form appears in Springfield, Massachusetts, before 1928. Various cultivars become popular landscape shrubs and roadside hedges, then escape cultivation throughout the eastern US and Canada. 1868 Garlic mustard, Alliaria petiolata, introduced from Europe by early settlers, is first recorded outside cultivation, on Long Island. 1875 Japanese barberry, Berberis thunbergii, introduced via seeds sent from Russia to the Arnold Arboretum in Boston; intended as a substitute for the European barberry, which the early colonists had introduced and used for dyes and jams, after it was discovered to carry wheat rust. 1876 Kudzu, Pueraria montana, introduced at the Japanese pavilion at the Centennial Exposition in Philadelphia, promoted as an ornamental and a forage crop. For more on kudzu, see here. Torpedo grass, Panicum repens, native to Africa and Eurasia, possibly introduced into Louisiana, is first collected near Mobile, Alabama. 1877 Common carp, Cyprinus carpio, native to the Caspian and Aral Seas, imported from Germany by the US Commission of Fish and Fisheries, in response to overharvesting of native species and to the need to feed the growing human population. Official stocking lasted for 20 years, reaching almost every state and territory, with fish often being released from railroad tank cars at bridge crossings. 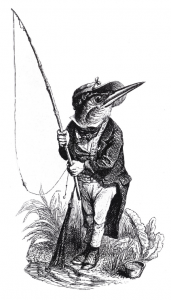 They established so well that efforts at eradication began almost as soon as stocking ended. 1877 Japanese knotweed, Fallopia japonica, is introduced via Britain, herbarium records show, as an ornamental and for use in erosion control. 1883 First introduction of brown trout, Salmo trutta, into the United States by US Fish Commission to Michigan State. After trout eggs, brought over from Europe, were raised at a local hatchery, the fish were released into the Pere Marquette River. Brown trout also introduced into New York through the Caledonia Fish Hatchery. 1884-85 Water hyacinth, Eichhornia crassipes, introduced into New Orleans at the World’s Industrial and Cotton Centennial Exposition. Plants taken back to Florida by a visitor were later put into the St. Johns River. 1886 Multiflora roses, Rosa multiflora, native to Korea, eastern China, and Japan, imported for use as root stock, expands aggressively by suckering. Now classified as a noxious weed in 12 states and in some places is illegal to plant. 1890-91 European starling, Sturnus vulgaris, introduced: one hundred released by the American Acclimatization Society in Central Park, part of an alleged effort to introduce all 64 bird species mentioned in Shakespeare. 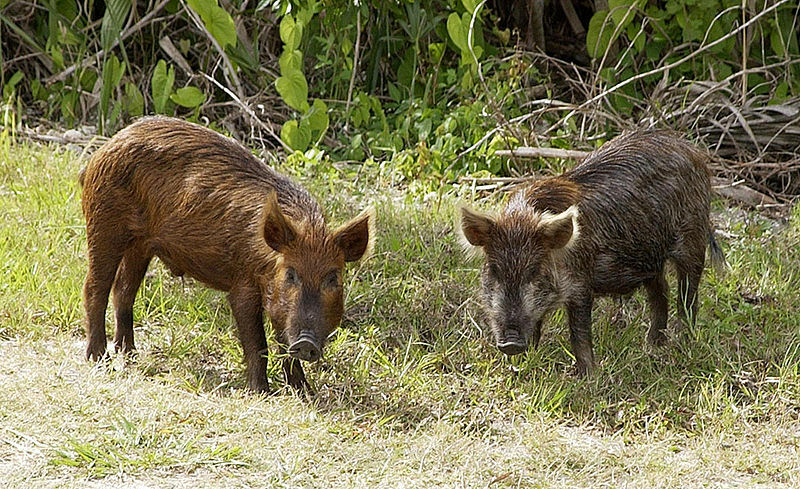 1893 50 wild boars imported from the Black Forest by railroad executive and robber baron Austin Corbin released in a 20,000-acre enclosure in New Hampshire for sport hunting. 1899 Nutria, Myocastor coypus, introduced into California for fur farming. The rodents fail to reproduce. ~1900 Russian knapweed, Acroptilon repens, introduced to Canada accidentally, along with alfalfa seed imported from Turkestan. Around 1910-1915, it was similarly introduced to California. Early 1900s Coral bush, Ardizia crenata, introduced into Florida from Asia as an ornamental. By 1982 it was found in the wild. 1905 Air potato, Dioscorea bulbifera, introduced to Florida as an ornamental vine and an edible tuber from tropical Asia via Africa; by the early 1970s it is recognized as a statewide pest. 1910 Wild taro, Colocasia esculenta, had initially been introduced much earlier by slaves who had brought corms from Africa, but it did not spread in the wild until promoted by the USDA to farmers as a potato-substitute. 1923 Red Swamp crayfish, Procambarus clarkii, also known as Louisiana crayfish, crawdad, and mudbug, is introduced to Hawaii as a food source for bullfrogs. Native to the south-central United States, and northeastern Mexico, it has been introduced, often deliberately, through much of North America, Europe, Asia, and Africa. Farmed crawdads are now imported into the US from China. 1930s Nutria imported for fur farms, and promoted as “weed cutters,” in Louisiana, Ohio, New Mexico, Washington, Michigan, Oregon, and Utah. Several state and federal agencies release nutria to promote fur trade and control aquatic vegetation. Now found in 15 states, it has been introduced to every continent outside its native South America except Australia and Antarctica. 1930s Red Imported Fire Ant, Solenopsis invicta, identified after Brazilian ships unloaded ant-infested cargo in the port of Mobile, and a 13-year-old boy–a certain E.O. Wilson, as he would later be known–reported the first colony of Red Imported Fire Ant in the US. 1936 (possibly earlier) Cane toad, Bufo marinus, native to northern South America, introduced to Palm Beach County, Florida, in a misguided attempt to control pest beetles in sugar-cane fields. — Amblyomma rotundatum, a South American tick, suspected to have entered the United States as a parasite on the cane toad, either in the 1930s or in later escapes and releases. The tick is now established in South Florida. 1938 Asian clam (Corbicula fluminea), native to southeastern Asia and Africa and imported to Washington State, possibly as a food source, begins its spread into the nation’s major waterways. Any intake pipe they can clog, they will. 1947-48 Locals introduce nutria throughout east Texas because of its value as a furbearer and reputation as weed cutter. 1950s Green iguana, Iguana iguana, native to Central and South America, found in the Florida Keys, perhaps having stowed away in fruit shipments from Central America. — Spike-topped applesnail, Pomacea diffusa, native to Amazonia, introduced to south Florida. 1962 Euell Gibbons publishes his first book, Stalking the Wild Asparagus, celebrating wild foods. Many of his chapters are about invasives. 1962 Northern snakehead, Channa argus, native to eastern Asia, imported for the Asian food market and for the pet industry in the United States, found in the wild in Maine. 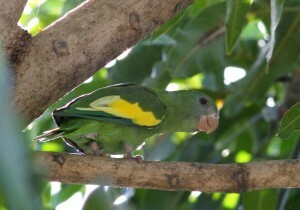 White-winged parakeet in Miami, Florida. Photograph by Andrew Spencer. 1966 New York City parks commissioner Thomas Hoving calls the pigeon, Columba livia, a “rat with wings.” The phrase sticks. 1968 White-winged parakeet, Brotogeris versicolurus, native to the Peruvian Amazon, escapes from its birdcage in south Florida and is sighted by a biologist. Imports of the bird are banned in the 1990s; wild flocks in Broward and Dade counties grow. 1980s Asian carp, (bighead, Hypophthalmichthys nobilis; black, Mylopharyngodon piceus; grass, Ctenopharyngodon idelia; and silver, Hypophthalmichthys molitrix), imported into the southern US to eat the aquatic plants in aquaculture facilities, escapes into the Mississippi, swimming north. — Eurasian collared-dove, Streptopelia decaocto, which spread throughout Western Europe in the mid-twentieth century, is introduced to the Bahamas from the Netherlands by a pet breeder in 1974. By the 1980s, it colonizes south Florida. Fueled by the seeds of backyard bird feeders, the species reaches Oregon in 1998. 1984 Spiny water flea, Bythotrephes longimanus, zooplankton from Eurasia, found in untreated ballast-water from freshwater Eurasian ports to Lake Huron. The flea, its eggs, and larvae catching in fishing gear have spread it to inland lakes and rivers. 1985 Lionfish, Pterois volitans, native to the Indo-Pacific, first documented off the coast of south Florida. Imported as a tropical fish for saltwater aquariums, lionfish disappointed hobbyists by devouring smaller fish and may have been dumped alive in open waters, where they soon spread. The species has since been observed from Venezuela to the Gulf of Maine. 1988 Zebra mussel, Dreissena polymorpha, introduced into the Great Lakes in ballast water from freshwater Eurasian ports. — Asian shore crab, Hemigrapsus sanguineus, first recorded at Townsend Inlet, Cape May County, New Jersey. It was likely released by incoming international cargo ships during ballast-water discharge. 1989 Green crabs spread from US East Coast to San Francisco, likely in the algae used to pack New England bait-worms. El Niño-strengthened currents help them northward after fishermen dumped the algae overboard. 1990 Africanized Honey Bee, Apis mellifera scutellata , reached southern Texas via South and Central America. An African bee, imported to South America and crossed with a European one to increase honey production, the hybrid proved aggressive. 1990 Round goby, Neogobius melanostomus, a fish native to Black and Caspian Seas, is found in the St. Clair River, between Ontario and Michigan. Probably transported in ballast water, it has spread into all five Great Lakes, where it is a threat to many native fish as a voracious eater of eggs. The goby may play a role in botulism outbreaks, killing fish and birds. 2000 Wakame Undaria pinnatifida, native to Asia, reported in California estuaries. 2002 Emerald ash borer, Agrilus planipennis, an Asian beetle, which likely arrived in wood packing materials used to ship auto parts and other products, identified in southern Michigan. — Redbay ambrosia beetle, Xyleborus glabratus, native to Asia, detected near Savannah’s Port Wentworth. Thought to have infested wooden packing materials unloaded at the port, it spread quickly along the Georgia coast and into Florida and South Carolina, attacking trees in the laurel family and causing a wilt for which there is no cure. 2006 Burmese python, Python molurus bivittatus, first documented in Florida Everglades. 2009 Kudzu bug from Asia first documented in the southeastern US. I remember the State of Washington trying to eradicate a snail from Capitol Lake in Olympia, Washington several years ago. I don’t think they were successful. Question: Blackberries are a basic source of nutrition year round for insects, snakes, lizards, birds, beetles, rodents, and numerous others, that make up the foundation of the food web. If they don’t have blackberries to survive on, after all these years of depending on them, what would they have to eat that is that available to them? I have seen NOTHING, not even clover that grows abundantly, which is why alot of those creatures exist in sufficient numbers – which are drastically declining, with the iradication of the blackberries. Great timeline! Please add nutria! According to the USGS (http://www.nwrc.usgs.gov/factshts/020-00.pdf), nutria were introduced into the United States in 1899 in California for the fur- farming industry. Since then, they have been introduced to many states and currently have viable populations in 15. Like many introductions of nonnative plants and animals, the introduction of nutria into the United States was intentional and originally viewed as a way to provide economic benefit. Subsequent introductions as well as escapes from captivity resulted in feral populations. The population along the Gulf of Mexico coast, for example, reportedly originated in Louisiana around 1937, when nutria imported for fur farming escaped from captivity. Nutria were also released into the Louisiana wild by state and federal agencies to provide a new fur resource and to control problem plants (invasives) such as the water hyacinth and alligator weed. Intentional and accidental introductions of nutria had an impact in Louisiana beyond what was originally realized; by the late 1950s there were an estimated 20 million nutria in coastal Louisiana. There doesn’t seem to be any mention of non-native trout brought to this country, or east coast trout brought out west. Thanks. We just added brown trout. Other suggestions? Weaver Finch – AKA House Sparrow. Suggested addition: Round Goby, a fish native to Black and Caspian Seas, found in St. Clair River in 1990, probably arrived in ballast. It has spread into all five Great Lakes where it is a threat to many native fish, being a voracious eater of eggs, and is thought to play a role in botulism outbreaks that periodically kill quantities of fish and birds. Thanks for the suggestion, Kate. Added above. Wow, thanks for putting this timeline together! Quite fascinating! I am half afraid to speak of using [dandelion] as food lest I should encourage laziness.